1. Combine 1/2 of the sliced shallots with the capers, oil, vinegar, lemon juice and set aside. 2. In a bowl mix together the tomatoes, the remaining shallots, the parsley and a pinch of salt. 3. Heat the grill and cook the mackerel fillets skin side first till cooked through, while the fish is cooking toast the bread. 4. To construct the dish, pile a spoonful of the salsa onto each slice of toast. 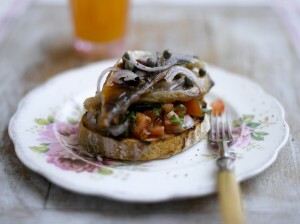 Cut each mackerel fillet in half and pile the two halves on top of the salsa then drizzle with the dressing.